A kefir-kombucha fermented herbal blend plus reishi mushroom. Suitable for those with joint complaints, pain and inflammation. Bio-activated nutrition for inflamed tissue. 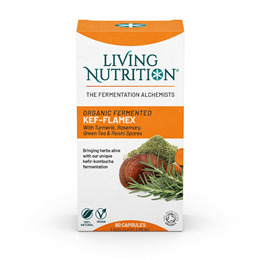 Kef-flamex is a synergistic blend of active nutrients for physical wellbeing. A healthy body requires a wide variety of nutrients in their most active form. Fermented blend (containing *Turmeric (Curcuma longa) root, *Green tea (Camillia sinensis) leaf, *Holy basil (Ocimum sanctum) leaf, *Rosemary (Rosmarinus officinalis) leaf, *Ginger (Zingiber officinale) root), *Reishi (Ganoderma lucidum) fruiting body, *Dandelion (Taraxacum officinale) leaf, *Nettle (Urtica dioica) leaf, *Ginger (Zingiber officinale) root, *Fennel (Foeniculum vulgare) seed, vegetable cellulose capsule (hydroxypropyl methyl cellulose). 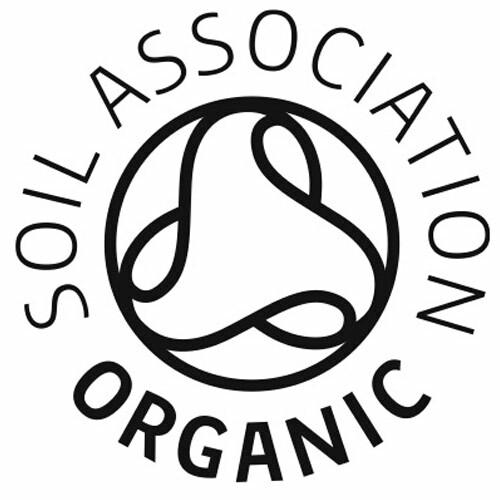 * Certified organic ingredients. 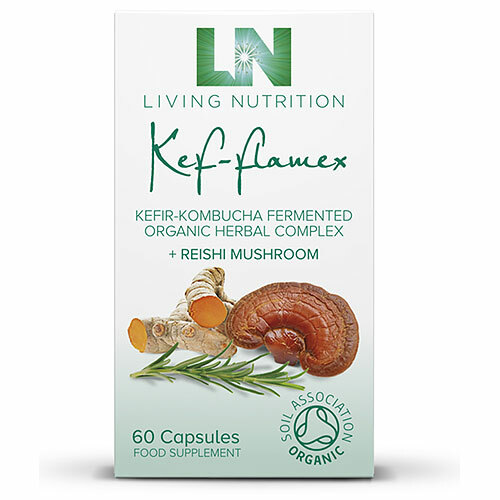 Below are reviews of Living Nutrition Kef-flamex - 60 Capsules by bodykind customers. If you have tried this product we'd love to hear what you think so please leave a review.